The suicide bombing incident that happened at the University of Oklahoma in Norman on October 1, 2005 has led to a great deal of speculation as to the motives and intent of Joel Henry Hinrichs III, the person who died in the blast. Law enforcement officials have generally been close-mouthed about their ongoing investigation, and the national media has so far only provided cursory coverage of the incident. As a result, the public has been forced to scrounge for details. The primary sources of information at this point are, on one hand, the local Oklahoma media, which are fairly reliable, and on the other hand two alarmist news services -- Northeast Intelligence Network and WorldNetDaily -- both of which claim to have exclusive details of a possible wider terrorist plot. But there is still no confirmation of these claims, and neither NEIN and WND are seen as entirely trustworthy. This crime scene image, which I created on October 5 (and updated on October 7), is based on details revealed in various reliable media outlets and Web sites, and on tips sent in by readers. Links documenting each fact are given below. This image (based on a NAVTEQ satellite image provided by Google Maps) shows the relevent sites related to the bombing that killed Joel Henry Hinrichs III at 7:30pm on Saturday, October 1, 2005. The dotted line traces a possible route taken by Hinrichs that evening. 1. Hinrichs' Apartment. According to The University of Oklahoma student directory, Hinrichs lived at 506-B Sooner Drive, near George Avenue (search for "Hinrichs" in the directory). Yahoo Maps confirms the location. Various sites reported that "nearby" apartments on George Avenue were evacuated when the police removed the explosives from Hinrichs' apartment, which also confirms the Sooner Drive location. This TV news report shows pictures of Hinrichs' building, and at various points "506," "B," and "Sooner Drive" are visible, which seems conclusive. (Also check out the close-up map from the ottergoose.net link below, which shows the exact building.) However, THIS ARTICLE in the Oklahoma Daily gives Hinrichs' address as 606 Stinson, which is just a short block away at the intersection of Stinson and Sooner -- as shown by this map at Yahoo maps. It seems at this stage that the Oklahoma Daily was in error on this detail. And according to THIS ARTICLE on channeloklahoma.com, his roommate was named Fazal M. Cheema, who was (apparently) a member of the Muslim Students Association, since the president of the MSA knew him well. 2. Islamic Society of Norman. According to THIS ARTICLE at NewsOK.com (site may require registration [free]), Cheema attended a "nearby mosque," and the FBI was looking into the possibility that Hinrichs also attended the same mosque. Furthermore, this NewsOK video report claims that "sources report seeing Hinrichs at the Norman Mosque." THIS SITE shows that there is only one mosque in the vicinity, The Islamic Society of Norman, which is only three blocks away from Hinrichs' apartment, at 420 E. Lindsey. THIS DIRECTORY shows that 420 E. Lindsey is also the office of the University of Oklahoma chapter of the Muslim Students Association, confirming that this was mosque attended by Cheema and possibly Hinrichs. However, Muslims in Norman now claim that Hinrichs never attended the mosque, flatly contradicting other news reports. This conflict has yet to be worked out. 3. Oklahoma Memorial Stadium. At the time of the explosion, a football game was being played at the campus stadium, with 80,000 fans in attendance. According to this article at NewsOK.com (again, NewsOK may require registration), "One OU senior, Adam Smith, of Oklahoma City, however, said a stadium guard Saturday night told him 'a guy had sprinted off' outside Gate 6 after refusing to let his backpack be searched." Several readers have emailed me to say that KOTV Channel 6 in Tulsa aired a report on October 5 stating that Hinrichs tried to enter the stadium twice, but was turned away when he refused to have his backpack searched -- but I was unable to find a link confirming this on the KOTV Web site. An article in Tulsa World has information about Hinrichs trying to gain access to the stadium shortly before the explosion, but Tulsa World recently made most of its news articles available only by paid subscription. Luckily, the article was reposted in its entirety on Free Republic. If Hinrichs had walked from his apartment to the blast site, he would have walked right past the stadium. An OU student who lives nearby says in a private correspondence that Gate 6 is on the north side of the stadium. If someone "sprinted away" west from Gate 6, he would come to the very place where the explosion happened. 4. Blast Site. According to THIS ARTICLE and THIS ARTICLE in the Oklahoma Daily, the explosion happened on the South Oval of the campus, in front of George Lynn Cross Hall. An official campus map downloadable at THIS PAGE shows the location of George Lynn Cross Hall, immediately to the west of the stadium. Another detailed pdf map of the campus, showing the location of George Lynn Cross Hall and the stadium, can be downloaded HERE. What does all this information suggest about Hinrichs' movements on the evening of the blast? The map composite above shows each location, and the likely route he took before he died in the explosion. News is breaking quickly on this case. If you have links to hard information that you think would be useful to add to this page, send them to tips@zombietime.com. NewsOK: Eyewitness claims in video report that Hinrichs appeared to be asleep while sitting on the bench moments before the blast. 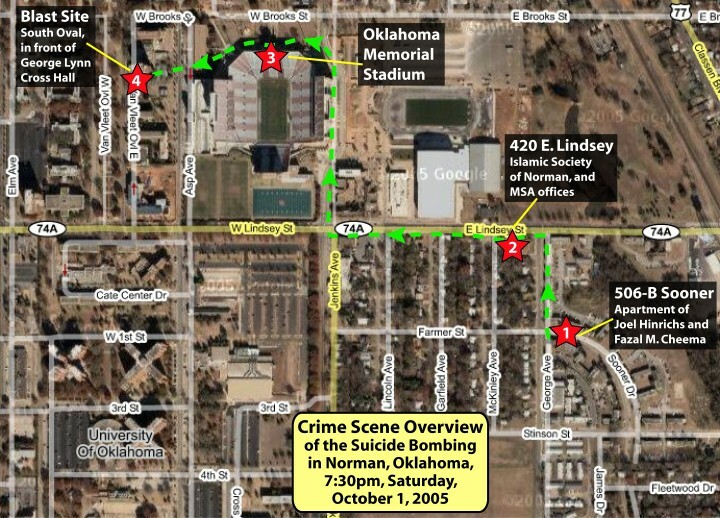 Ottergoose.net: OU student and blogger Nick Benson has extensive eyewitness accounts of the investigation, including maps and photos that he took himself. Tapscott's Copy Desk: Exclusive -- tree at bomb site shows evidence of round shrapnel holes -- possible evidence of a bomb intended to cause harm to others. channeloklahoma.com: Hinrichs Tried To Buy Ammonium Nitrate. Accuracy in Media: Cinnamon Stillwell analyzes the media blackout of this bombing incident. Norman Transcript: The explosion was so powerful that it was heard four miles away. WFAA.com: The stadium was "vibrating" from the force of the blast (link may require free registration). Associated Press (in 2002): Zacarias Moussaoui, the "20th hijacker" of 9/11, was connected to the Islamic Society of Norman. Oklahoma Daily (repeat of link above): Hinrichs was vaporized from the waist up by the bomb. channeloklahoma.com: MSA claims Hinrichs not a member. Flopping Aces: Good rundown of the known facts. channeloklahoma.com: sidebar with comprehensive list of Hinrichs-related news stories and TV reports. GoogleNews: Overview of news links related to the case. Northeast Intelligence Network Hinrichs part of Muslim terror cell in Norman. bellaciao.org: OU President David Boren, who has connections to the intelligence community, is trying to downplay the incident, because of school debts related to the stadium. AR15.com: If you have the patience to read through the whole thing, this thread has several eyewitness accounts of the blast and details about Hinrichs' activities.